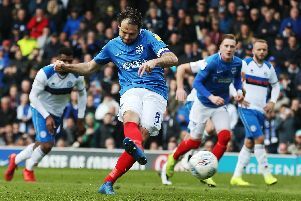 Pompey defender Matt Casey faces three months on the sidelines with a fractured collarbone dealing a big blow to Gosport Borough where he is on loan. The loanee will be out of action as Craig McAllister and Matt Tubbs take their side to Harrow Borough in the Southern League premier division south on Saturday. Casey picked up the injury towards the end of an impressive debut for Borough in their 1-0 FA Cup win at Sittingbourne. It means Borough are forced to reshuffle their defence again. Manager McAllister is so disappointed for the youngster who would have been a key addition for Gosport. He said: ‘You have to feel for the young lad. ‘He picked up the injury in the last five minutes of the game. ‘The ball was out in a wide area and he didn't have to go out there. ‘But his enthusiasm meant he wanted to go out and win the ball. ‘He won the header but fell over his opponent and landed awkwardly on his shoulder. Borough will face a difficult task at Harrow as they look to pick up their first away points of the season. The two teams are similar in that they are both scoring and conceding lots of goals. After their success on the road in the FA Cup McAllister is confident his team can show an improvement in their away form. He added: ‘The lads were buzzing after the win at Sittingbourne. ‘It showed them they can win away from home. Borough goalkeeper Mark Childs could be back within the fortnight after suffering a hamstring problem. McAllister is excited by the prospect of having attacking midfielder David Gerrard back in the fold. Gerrard is due to return to training this week. He added: ‘Having him back will make a huge difference for us. ‘He is a quality player who works hard to create lots of opportunities for others. ‘Also he has the knack of getting into good positions in the opposition area. McAllister is delighted with the progress made so far this season following the problems of last year. He and coach Matt Tubbs have banished the sense of defeatism around the club. Unlike previously if Borough fall behind in games they have shown they can battle their way back into the contest.